Be the first to share your favorite memory, photo or story of Billie "Bill". This memorial page is dedicated for family, friends and future generations to celebrate the life of their loved one. 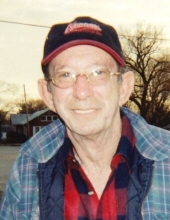 Billie E. “Bill” Clifton, 87, of Cherryvale, Kansas passed away Sunday, November 11, 2018 at Wilson County Medical Center in Neodesha, Kansas. Billie Eugene Clifton was born November 5, 1931 in Morehead, Kansas the son of John Arnold Clifton Sr. and Pearl (Axthelm) Clifton. He grew up in Cherryvale and attended Cherryvale Schools. On December 31, 1950 in Obion County, Tennessee he was united in marriage to Helen Kirby and they were later divorced. He was later united in marriage in 1991 in Union City, Tennessee to Martha Alexander and they later divorced. Bill worked as a pipeline welder and as a farmer in his early years. He later was an owner operator truck driver from 1978 until he retired in 2005. Survivors include his children, Terry Eugene (Leslie) Clifton of Cherryvale, Kansas, Linda Violet (Donald) Mclane of Coleman, Michigan, 7 grandchildren, 11 great grandchildren, 3 great great grandchildren. He was preceded in death by his parents, daughter, Wanda June Bramlett, grandson, Edward Kreklau, Jr., 8 sisters and 8 brothers. Celebration of Life Funeral Services will be held 2:30 P.M., Friday, November 16, 2018 at Wickham Family Funeral Home, 216 East 4th, Cherryvale, Kansas. The family will receive friends from 6:00 P.M. until 7:30 P.M., Thursday, November 15, 2018 at the funeral home. Interment will follow the service at Varner Cemetery in rural Neodesha, Kansas. To send flowers or a remembrance gift to the family of Billie "Bill" E. Clifton, please visit our Tribute Store. "Email Address" would like to share the life celebration of Billie "Bill" E. Clifton. Click on the "link" to go to share a favorite memory or leave a condolence message for the family.